It’s been raining quiet a bit in Delhi these days, and I just feel blissful even though I am stuck in office and have to watch it through a giant glass window from my cabin. Anywho, enough of me mourning, is there anyone else who finds their makeup looking crappy half-way through the day, on those rainy-humid days? Well, I was definitely one of those people until a few weeks ago. When the weather started changing in Delhi, and it started to rain, my crappy-looking makeup at the lunch hour got me thinking *what am I doing wrong? *, then it hit me, *I need to make a few changes in my makeup routine* If we can have a summer-makeup routine or fall-makeup routine, then why not a monsoon-makeup routine? Use less/lighter foundation: this I guess is the most important step. You can have fabulous eye makeup and lips but still have a cakey, oily-from-humidity face. I’ve been there nobody likes a cakey face (except for if it’s your birthday and your friends smear the cake all over your face). Try using a lighter foundation, probably a one with a lighter-to-sheer coverage. However, I prefer using a BB cream, cos it’s lighter formula and doubles-up as a moisturizer. Try the Deborah Milano BB cream ( Rs 350/-), it’s great for oily-combination skin. Waterproof Mascara: Rainy days scream for waterproof mascara. Don’t even think about using a regular mascara if you see a cloud in the sky, even thinking about should be illegal by the way. 🙂 Pop on some waterproof mascara and skip your liner, a few coats and you are good to go! May I suggest the L’oreal 4D Lash Architect Mascara (Rs 735/-). Cream Blushes: Creamy products reflect water and do not get cakey on an oily face. Cream blushes are a good option and they keep you looking glowy and youthful. My fave is the NYX rouge cream blush (Rs 650/-). Matte no transfer lip tints or balms: These lip stains or tints are a girl’s best friends. They stay on the entire day, they don’t budge and they look more natural. Pop some on in a bold color to brighten up those gloomy days. I love the Revlon Just Bitten Kissable Balm Stains (Rs 600/-). 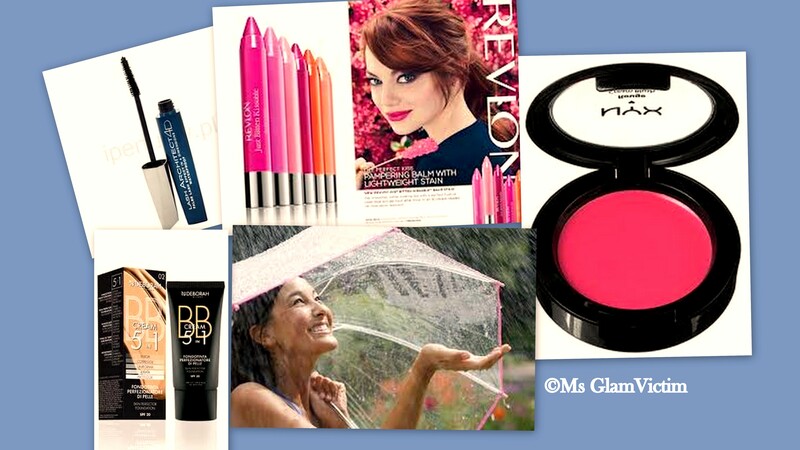 Share some of your makeup tricks & tips for rainy days below, I would love to read them.